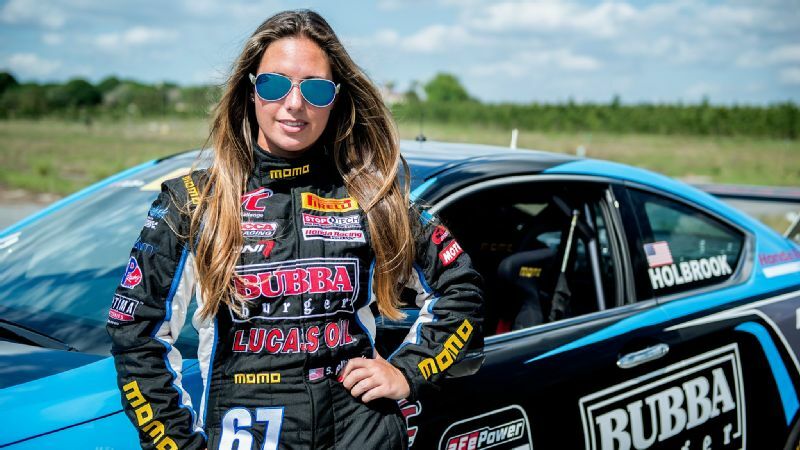 Mary Beck had no idea she wanted to work in sports back when she was a history major in college. But then this trailblazer with a refreshingly candid sense of humor went on to become one of the youngest vice presidents at MLB headquarters in New York at age 32. 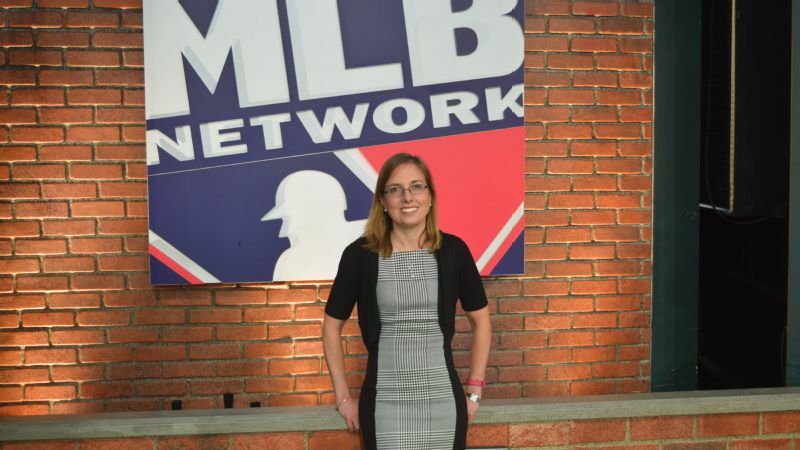 After transitioning to MLB Network for its launch in 2008, Beck, now the senior vice president of marketing and promotions, has added the NHL Network to her purview, when it moved to its Secaucus, New Jersey, headquarters. 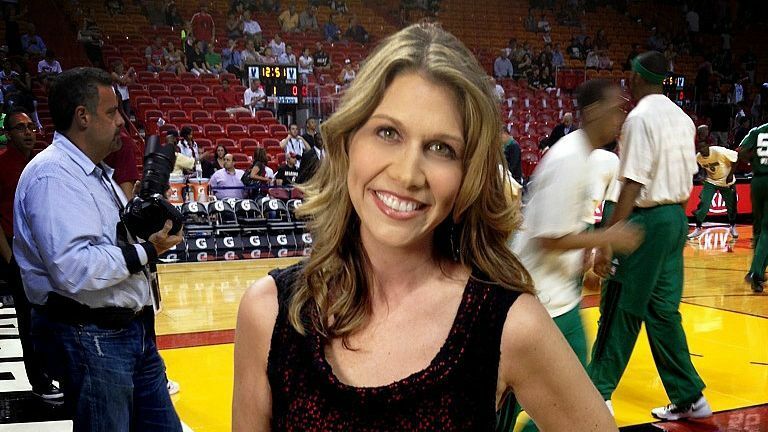 With baseball season a couple of months in and the Stanley Cup playoffs in full swing, she lets us in on her path -- which has taken her from selling knives to mastering dual duties with two major sports networks -- and explains how a tape gun is still one of the most prized possessions in her office. My love for baseball started with my mom, who's a huge Yankees fan. My dad grew up obsessed with the Brooklyn Dodgers, so his heart was broken when they left, and he never looked back. But I had to follow the team old-school through the newspaper or radio because I grew up without a television in the house. I have six siblings, so my parents believed that a TV would just be another thing for us to fight over when it came down to what to watch. They preferred if we just went outside and fought there. Not literally of course but by just running around after each other. Although people find it interesting that I've now worked for five stations over my career -- CNN, TBS, TNT, MLB Network and the NHL Network -- when I never even had a television growing up. I was a history major at Cornell and graduated to, "What the heck do I do now?" I called my dad and said, "Why didn't you send me to trade school because what do I do with a major in history?" And he said, "A liberal arts education will teach you how to think." And I said, "What I think is that I need a job." I spent one summer selling Cutco knives. I can still give a demonstration on how to slice through a penny. My father thought it was a waste of time back then, but he later said that it was useful because it taught me the power of rejection. I also sold advertising for the Yellow Pages because I thought it would be a good business to learn. What I learned is that when you're schlepping through Manhattan with Yellow Pages over your shoulder, you better wear comfortable shoes. It's something I repeat to women to this day: You can't underestimate the value of comfortable shoes. But then I decided to take a sports marketing class at NYU's continuing education program and was hooked. For me, it was Jacqueline Parkes, who was MLB's chief marketing officer. She was assigned to the Commissioner's Initiative program and was able to select one person internally to assist her with it, and she selected me. There were so many components to it. We started looking at how to ramp up the pace of play and how to make the broadcasts more exciting by adding in-game interviews with players and having the managers miked up. We also instilled a league-wide Jackie Robinson Day and designated Mother's Day for breast cancer awareness. Those were definitely some of the highlights. Under Jacqueline's leadership, I went from manager to director to vice president fairly quickly. But I don't recall any direct pushback from my male colleagues. Yes, she advocated for me, but everyone she had to speak to in order for me to get the promotions was male. If there was any pushback, I think it was because of me personally, since I tend to have a big mouth. Although I did hear during my third pregnancy, "Wow, you're a regular baby factory." Um, thank you? I was at LAX with Jacqueline in June 2008 when she received a call from MLB Network president Tony Petitti saying he was looking for someone to run the marketing team heading into launch and needed suggestions. So she suggested me. I don't think he realized I was standing next to her at the time. 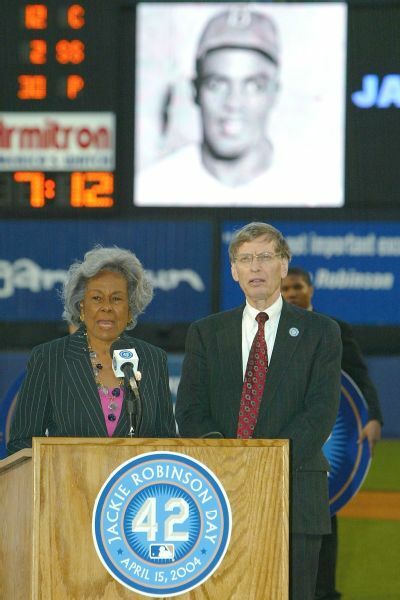 In her work with MLB's Commissioner's Initiative program, Beck helped install a league-wide Jackie Robinson Day, whose launch was celebrated here in 2004 by Robinson's wife, Rachel, and then-commisioner Bud Selig. But it was a big decision to make the jump. When I met with him I said, "I live in Connecticut and that's in New Jersey. I have a good thing going currently at MLB." But he told me to think about it and would call periodically to follow up. Every time I would say, "I have some more questions for you." And then I bumped into him on Park Avenue and he said, "Have you made your decision yet?" And again I said, "I have some more questions for you." And he just laughed and replied, "OK, who's interviewing who here?" But I think it's important to really find out what you're getting into before you make such an important decision, and I really wasn't sure if I was ready to leave. Apparently I was, since this is now my eighth year here in Secaucus. I think the biggest challenge early on was creating awareness about the network. So when we launched, people said, "You should have a billboard on the West Side Highway! Or you should have a video in Times Square!" And I'm like, "No, I only really need to speak to baseball fans because if you don't like baseball, you don't care that MLB Network exists." So I wanted to get the fans when they were actually consuming baseball. I found the best way to do that was by working with all 30 clubs to get signage and scoreboard videos up in all the stadiums and to create giveaway days. Even right now we have close to three quarters of a million grocery tote bags with our logo on them that we print and then distribute at the stadiums. That's where the tape gun comes into play, since I'm always jumping in to help with the boxing of promotional materials to send around. But the biggest change between then and now has been the exponential growth of social media. We have Facebook polls and Twitter questions that play out on-air and our shows have tickers across them for viewers to weigh in and engage. We need to keep content relevant with an audience that might not even be watching with us on TV anymore but on other outlets. Another thing I tell them is not to limit themselves, because there really are so many sports jobs out there. We also just redesigned some of the MLB studios here to dedicate them strictly to hockey in time for the Stanley Cup playoffs going on now. But I was excited about the NHL coming onboard. I don't mind doing double-duty. It's better to be busy. I always say that. One of the things I tell college students is that they're light years ahead of me since I didn't know I even wanted to work in sports at their age. But another thing I tell them is not to limit themselves, because there really are so many sports jobs out there. Someone will come up to me and say, "My dream is to work for the New York Yankees." And I'll say, "That's great, you can work for the Yankees on 161st Street each day, but if you don't land a role there, you can also work for the Yankees by working at the YES Network or for their WFAN radio broadcast or even work for Delta or Pepsi in their Yankees sports marketing group." But really the two main things I always say for advice is, "I can't teach you to work hard, and I can't teach you to be smart about how you work, but anything else, particularly on the marketing side, you can be taught." So I look for people who come in with those two things. To me it's less about the internships you've had or your major. It's more about demonstrating that you have a passion for what you do and that you're ready to roll up your sleeves and actually work. And sometimes that means picking up a tape gun.